Thinking about selling your home in 2019? Rosemary can give you advice on improvements that will highlight your home’s strengths, downplay its weaknesses and appeal to the greatest possible pool of prospective buyers. Although the structure itself is often the deciding factor, many steps must be taken to enhance your home’s features and increase the likelihood of it selling faster. Why settle for less than the “Best” to sell your home? Call Rosemary today! 805.479.7653 rosemaryallison@aol.com callrosemary.com - CIO, AXA Assistance The Magic of this Season Never Ends. The Greatest Gifts are Family and Friends. We wish you a Joyous New Year filled with health, happiness and prosperity. May all the good blessings be yours in abundance throughout the coming New Year. Real estate agents affiliated with Coldwell Banker Residential Brokerage are independent contractor agents and are not employees of the Company. ©2018 Coldwell Banker Residential Brokerage. All Rights Reserved. Coldwell Banker Residential Brokerage fully supports the principles of the Fair Housing Act and the Equal Opportunity Act. Owned by a subsidiary of NRT LLC. Coldwell Banker, the Coldwell Banker Logo, Coldwell Banker Global Luxury and the Coldwell Banker Global Luxury logo service marks are registered or pending registrations owned by Coldwell Banker Real Estate LLC. CalRE# 00545184. Michelle Menzel | GreatWay Roofing Company, Inc.
President’s Message the trust and respect of those with differing viewpoints. While you never hope to see the words “…strong” after your community’s name, the heart and resilience of the Conejo shined brightly in the moments during and after the tragedies of November 2018. Our feature story takes a closer look at five organizations that were instrumental during the tragedies and how they continue to support the community in the first steps towards our future. 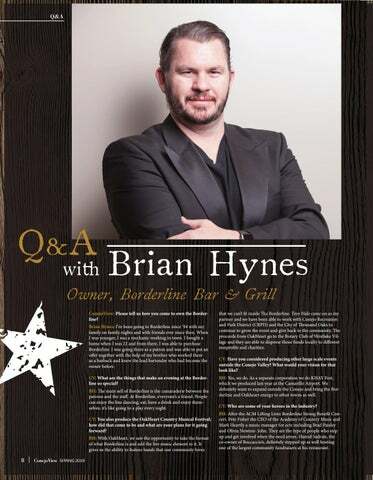 Our Executive Profile gives us more insight into the beloved owner of Borderline, Brian Hynes, and how he’s carrying on in honor of both those lost and those who remain behind. Our business profiles showcase entrepreneurs in our three cities, inviting you to learn more about: Candu Graphics, Dream Dinners and Mejico Grill & Tequila Lounge. Speaking of our three cities; they all have newly elected Councilmembers! Learn more about these public servants and stay tuned as they each put their own caring mark on our community. Our featured nonprofit is CASA, an organization that supports court-appointed advocates for abused or neglected children, towards providing safe and healthy homes for them to thrive in. If you’re doing business in the Conejo, chances are you’re already productive, but there’s always room for improvement! Are two monitors better? Is your office using Slack? Check out our tips! 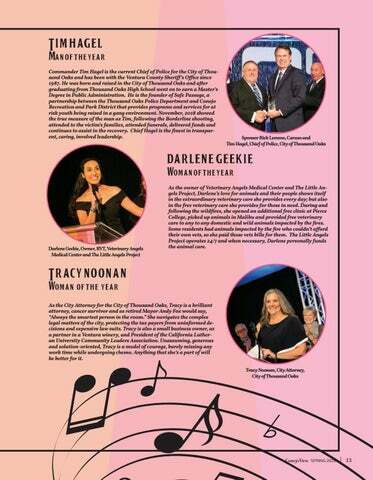 Our Annual Gala celebrates our Man, Woman, Business, Nonprofit, Volunteer, Ambassador and Corporate Sponsor of the Year as well as our outgoing Board Chair. This year, MC Patrick Cassidy, Artistic Director of 5-Star Theatricals, produced a Beatles love-fest for our guests and honorees. I hope you enjoy the pictures as much as we did the event! As 2018 came to a close under unimaginable circumstances, the Conejo Valley business community rallied in partnership with the Chamber to stand behind the recovery efforts for the Borderline tragedy and the Hill and Woolsey Wildfires. The result of these efforts was a $50,000 donation by the Greater Conejo Valley Chamber of Commerce. These are the five organizations that the donation was distributed to and their efforts to support the immediate needs and the long term recovery efforts. the pads of his feet completely burned off. Champ, captured the hearts of the medical staff who provided care to him for over two months while giving him the love and attention he deserved. The medical staff werenâ&#x20AC;&#x2122;t the only ones invested in Champ; the community was also very passionate about his survival story and were determined to find him a new home after no one had stepped up to claim him as their own. One gentleman, Kenneth Lott, saw Champ on social media and called every day for updates on his condition. After weeks of discussion, everyone decided that Kenneth would be the perfect fit for Champ and he is so happy in his new home with Shepard sister, Luna. Since the fires, The Little Angels Project has continued to provide free medical assistance to any families and their pets affected by the fires and will continue to do so until care is no longer needed. Cal Lutheran Tragedy Assistance Fund The $21,000 in donations made to the Cal Lutheran Tragedy Assistance Fund are being used to support students, staff and faculty who suffered because of the Borderline shootings and the wildfires in November. The fund allowed the university to provide gift cards to cover immediate needs for people who lost homes and were dislocated during the fires. It also paid for massage therapy for survivors and campus staff members who worked long hours to counsel, care and support those affected. As the recovery efforts continue, it provides food and supplies for the meetings of a survivors group comprised of students who were at Borderline during the shooting. This spring, funds will be used for several events to promote healing including art projects and mindfulness, yoga and labyrinth sessions. Any remaining funds will be used to cover the cost of additional counseling that is being provided by the Counseling and Psychological Services office to serve the higher-than-normal volume of requests it is receiving. Cal Lutheran also provided a range of support not covered by the fund, including therapy horses, a puppy petting zoo and social activities and gatherings. Pepperdine Strong Fund The tragedies that struck the Pepperdine, Malibu, Ventura, and Conejo Valley communities last November were unprecedented. As Pepperdine struggled to come to terms with the senseless loss of beloved student Alaina Housley, the Woolsey Fire forced many students and employees to evacuate their homes. In the wake of tragedy, the University witnessed an incredibly swift and generous outpouring of love, care, and support from the global Pepperdine family and the community at large. Many selflessly opened their homes to shelter displaced students, faculty, and staff due to the Woolsey Fire and Pepperdine friends from across the globe provided financial support to aid crisis response efforts by giving to the Pepperdine Strong Fund. Through the generosity of nearly 1,700 donors, Pepperdine was able to raise more than $500,000 to support those affected in our community. As a result of these gifts, the Student Care Team at Pepperdine provided direct support to 158 students, including 57 Pepperdine students and 16 University employees who lost everything. Dozens more suffered partial loss of their homes and many others were displaced or experienced fire-related loss. The funds raised helped address food insecurity, replace damaged and lost belongings, and provide essential supplies including toiletries, bedding, clothing, book bags, and temporary housing. Ventura County Community Foundation Conejo Valley Victims Fund On the heels of two community tragedies, the Ventura County Community Foundation launched into action to support those impacted by the Borderline shooting and Hill/Woolsey Fires. Partnering with nonprofits and agencies throughout the nation, VCCF designed protocols and processes for disbursing millions of dollars donated by those eager to support their fellow community members. The first two rounds of support to the victims and survivors of the Borderline shooting were distributed. VCCF awarded an immediate $70,000 in $500 pre-paid Visa cash cards so immediate basic needs could be met through the Thousand Oaks Victims Assistance Center. VCCF also awarded a total of $240,000 to help cover memorial costs to families who lost loved ones; those funds were personally delivered by Chief of Police Tim Hagel to these families. The funds raised for the Hill/Woolsey Fire Sudden and Urgent Needs Effort are targeted toward nonprofit organizations supporting recovery and relief efforts.The Ventura County Community Foundation has granted more than $1,125,321 since the start of the Hill and Woolsey fires to organizations assisting individuals and animals including the Pacific Coast and Ventura County Chapter of the American Red Cross, Boys and Girls Club of Greater Conejo Valley, Southeast Ventura YMCA, Salvation Army, KCLU Public Radio, Cal State Channel Island Foundation, and many more. 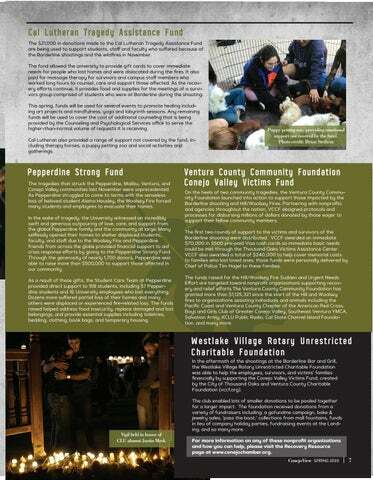 Westlake Village Rotary Unrestricted Charitable Foundation In the aftermath of the shootings at the Borderline Bar and Grill, the Westlake Village Rotary Unrestricted Charitable Foundation was able to help the employees, survivors, and victimsâ&#x20AC;&#x2122; families financially by supporting the Conejo Valley Victims Fund, created by the City of Thousand Oaks and Ventura County Charitable Foundation (vccf.org). The club enabled lots of smaller donations to be pooled together for a larger impact. The foundation received donations from a variety of fundraisers including: a gofundme campaign, bake & jewelry sales, â&#x20AC;&#x2DC;pass the boot,â&#x20AC;&#x2122; collections from mall fountains, funds in lieu of company holiday parties, fundraising events at the Landing, and so many more. 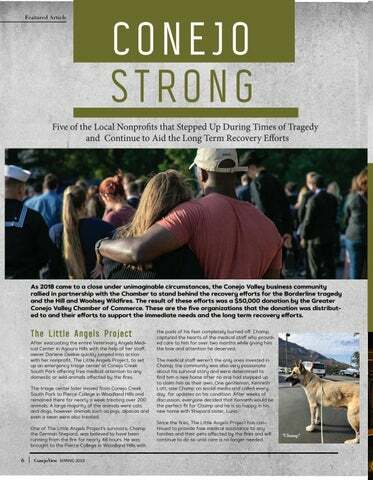 For more information on any of these nonprofit organizations and how you can help, please visit the Recovery Resource page at www.conejochamber.org. that we can’t fit inside The Borderline. Troy Hale came on as my partner and we have been able to work with Conejo Recreation and Park District (CRPD) and the City of Thousand Oaks to continue to grow the event and give back to the community. The proceeds from OakHeart go to the Rotary Club of Westlake Village and they are able to disperse those funds locally to different nonprofits and charities. CV: Have you considered producing other large scale events outside the Conejo Valley? What would your vision for that look like? BH: Yes, we do. As a separate corporation we do KHAY Fest, which we produced last year at the Camarillo Airport. We definitely want to expand outside the Conejo and bring the Borderline and Oakheart energy to other towns as well. CV: Who are some of your heroes in the industry? 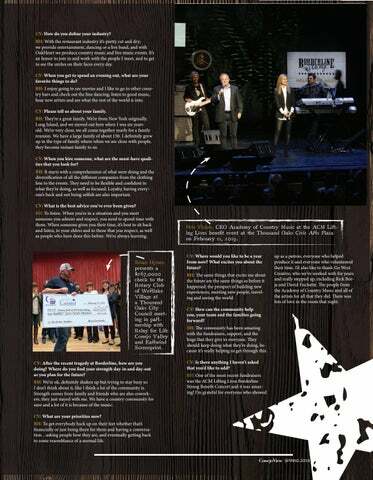 BH: After the ACM Lifting Lives Borderline Strong Benefit Concert, Pete Fisher the CEO of the Academy of Country Music and Mark Heartly a music manager for acts including Brad Paisley and Olivia Newton- John. They are the type of people who step up and get involved when the need arises. Hamid Sadraie, the co-owner of Boccaccio’s, definitely stepped up as well hosting one of the largest community fundraisers at his restaurant. CV: How do you define your industry? BH: With the restaurant industry it’s pretty cut and dry; we provide entertainment, dancing or a live band, and with OakHeart we produce country music and live music events. It’s an honor to join in and work with the people I meet, and to get to see the smiles on their faces every day. CV: When you get to spend an evening out, what are your favorite things to do? BH: I enjoy going to see movies and I like to go to other country bars and check out the line dancing, listen to good music, hear new artists and see what the rest of the world is into. CV: Please tell us about your family. BH: They’re a great family. We’re from New York originally, Long Island, and we moved out here when I was six years old. We’re very close, we all come together yearly for a family reunion. We have a large family of about 150. I definitely grew up in the type of family where when we are close with people, they become instant family to us. CV: When you hire someone, what are the must-have qualities that you look for? BH: It starts with a comprehension of what were doing and the diversification of all the different companies from the clothing line to the events. They need to be flexible and confident in what they’re doing, as well as focused. Loyalty, having everyone’s back and not being selfish are also important. CV: What is the best advice you’ve ever been given? BH: To listen. When you’re in a situation and you meet someone you admire and respect, you need to spend time with them. When someone gives you their time, it’s best to sit back and listen, to your elders and to those that you respect, as well as people who have done this before. We’re always learning. Brian Hynes presents a $267,0000 check to the Rotary Club of Westlake Village at a Thousand Oaks City Council meeting in partnership with Relay for Life Conejo Valley and Eastwind Screenprint. CV: After the recent tragedy at Borderline, how are you doing? Where do you find your strength day-in and day-out as you plan for the future? BH: We’re ok, definitely shaken up but trying to stay busy so I don’t think about it, like I think a lot of the community is. Strength comes from family and friends who are also coworkers; they just stayed with me. We have a country community for sure and a lot of it is because of the music. Pete Fisher, CEO Academy of Country Music at the ACM Lifting Lives benefit event at the Thousand Oaks Civic Arts Plaza on February 11, 2019. CV: Where would you like to be a year from now? What excites you about the future? BH: The same things that excite me about the future are the same things as before it happened: the prospect of building new experiences, meeting new people, traveling and seeing the world. up as a patron, everyone who helped produce it and everyone who volunteered their time. I’d also like to thank Go West Creative, who we’ve worked with for years and really stepped up, including Rick Borja and David Fischette. The people from the Academy of Country Music and all of the artists for all that they did. There was lots of love in the room that night. CV: What are your priorities now? BH: To get everybody back up on their feet whether that’s financially or just being there for them and having a conversation…asking people how they are, and eventually getting back to some resemblance of a normal life. Dream Dinners is a unique company founded on a mission of bringing families together around the dinner table. From easy preparation, to joyful participation, a smiling face to a helping hand, they provide all the ingredients for a great meal. For many busy families, meal planning, grocery shopping and cooking daily meals can be an overwhelming task. Dream Dinners was created to take the hard work out of getting a home cooked meal on the dinner table. They handle the menu planning, grocery shopping, prep work and even the clean up! drugs and alcohol. Dream Dinners wants to make a difference in families’ lives by helping them make dinnertime easy. In addition to helping families come together during the dinner hour, Dream Dinners is also committed to giving back to the local community. They provide donations for silent auctions and fundraisers each year and also organize in-store fundraisers to help nonprofit organizations raise funds. They also host private events for showers, book clubs, supper clubs and other groups. are you thinking of buying or selling your home? Specializing in helping families and their aging parents with all aspects if downsizing and relocation. ATTENTION ALL CONTRACTORS AND HOMEOWNERS IN THOUSAND OAKS From framing to windows and doors to interior finish BMC offers a selection of high-quality building products. Los A ngeles R a ms – Business of th e Year The Los Angeles Rams currently train at California Lutheran University with corporate headquarters in Agoura Hills. While competing at the highest level, this NFL team also stepped up to support their new community. During the Summer of 2018 they worked with the City of Agoura Hills to distribute 300 backpacks to local families and in October, they teamed up with Make-A-Wish Tri Counties raising over $215,000 to grant wishes of local children battling life-threatening medical conditions. When the back-to-back tragedies struck the Conejo Valley, the team coordinated a telethon fundraiser that raised over $2 million dollars and hosted a touching tribute during ‘Monday Night Football’ to honor first responders and those affected by the California wildfires and Borderline shooting. The Rams went on to compete in Super Bowl LIII for the first time in 17 years, while putting Conejo Valley on the map. With more than 30 years of experience, Mustang Marketing is the largest full-service marketing firm in Ventura County. Its clients range from nationwide consumer companies to some of the smallest businesses in our community. Mustang has provided pro bono services for the Conejo Schools Foundation, Ventura County Sheriff’s Foundation, Borderline fundraisers and Family Justice Center, to name a few. 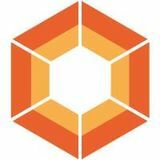 They offer everything from full-scale macro-view strategic plans, to all relations (public, community and government), to every creative avenue possible, from the most complex website to the tiniest trade show giveaway. Mustang supports its individual team members in their numerous contributions to the community as Chamber board members and ambassadors, VCLA graduates, nonprofit leaders, elected representatives, and Woman of the Year and 40 Under Forty recipients. Commander Tim Hagel is the current Chief of Police for the City of Thousand Oaks and has been with the Ventura County Sheriff’s Office since 1987. He was born and raised in the City of Thousand Oaks and after graduating from Thousand Oaks High School went on to earn a Master’s Degree in Public Administration. He is the founder of Safe Passage, a partnership between the Thousand Oaks Police Department and Conejo Recreation and Park District that provides programs and services for at risk youth being raised in a gang environment. November, 2018 showed the true measure of the man as Tim, following the Borderline shooting, attended to the victim’s families, attended funerals, delivered funds and continues to assist in the recovery. Chief Hagel is the finest in transparent, caring, involved leadership. As the owner of Veterinary Angels Medical Center and The Little Angels Project, Darlene’s love for animals and their people shows itself in the extraordinary veterinary care she provides every day; but also in the free veterinary care she provides for those in need. During and following the wildfires, she opened an additional free clinic at Pierce College, picked up animals in Malibu and provided free veterinary care to any to any domestic and wild animals impacted by the fires. Some residents had animals impacted by the fire who couldn’t afford their own vets, so she paid those vets bills for them. The Little Angels Project operates 24/7 and when necessary, Darlene personally funds the animal care. Congratulations to all of our 2019 honorees! TOUR OUR CAMPUS Meet our confident, capable, and compassionate students. A La Reina education develops the “whole girl” and empowers young women to stand up for themselves and fearlessly chase their dreams. Experience firsthand how La Reina is leading the way! La Reina admits students of any creed, race, color, national and/or ethnic group to all rights, privileges, programs and activities at the school. What was the most impactful case you ever had to you personally (won or lost)? No single case is definitive. Over the years, cases, legislation and solutions build a foundation of experience that is used to deal with the future conflicts. What path led you to become the President of CalChamber? I was born and raised in Beaver Falls, Pennsylvania. I hold a B.S. in Economics from Penn State University and a J.D. from the McGeorge School of Law, University of the Pacific where I was a member of the Law Journal. You’re a lawyer by training; what did you love most about the law and least? I liked learning how to analyze facts, the applicable law and creating solutions. I can’t say I don’t like the law, but practicing law for money requires billable hours and that is distasteful for most attorneys. Do you miss being a lawyer? Why or why not? I am still an active member of the Bar. I practice law every day in creating and reviewing legislation. I still review judicial opinions and all of our lobbyists are attorneys. I was on my way to the courthouse in Sacramento when my transmission seized up and threw my car into a spin on the freeway. As I was waiting to be towed, a former boss of mine, who was working for Attorney General George Deukmejian, was stuck in traffic and asked me if I would leave private practice and come to work for him in the Attorney General’s legislative affairs unit. I did, and when George Deukmejian became Governor, I went to the Governor’s office and was eventually recruited to join CalChamber. Your work has saved businesses money every single day whether they realize it or not. I believe your work on workers compensation reform has been particularly impactful. If you could improve anything about that system today, what would those things be? Workers Compensation reforms always erode over time and the last major reform occurred over ten years ago. We need some updated analyses to see what gaps are being exploited to drive up costs. Your reputation for productivity and collegiality in working across the aisle is a model for all Chamber CEO’s in the state. What are some key results that you’re particularly proud of? One has to have the goal of accomplishing something beneficial, rather than just making business feel good by complaining about the laws and issues they don’t like. When I worked for a Republican Governor and the legislature was dominated by Democrats, I learned how to work with different perspectives to reach solutions. Is there a particular governor who has impressed you above others? Why? George Deukmejian. He was ethical and trustworthy. He was strategic. He knew when to challenge and when to reach consensus. Was there a governor who was more difficult to work with than any other? How did you handle it? We better be able to work with all Governors, or we won’t be able to accomplish our goals. What are your biggest concerns for the California business community in 2019 and the next few years? The divisive rhetoric in the rest of the country is fueling a progressive agenda in California that is intended to counter everything in Washington. We need to make sure that any agenda does not jeopardize the ability to do business in California. What do you consider to be your biggest failure or regret? Any lessons from it? I make mistakes every day. Recognize them and try not to repeat them. When you have downtime, what do you like to do? Golf, play with my dogs and visit my son in New York City. What are you reading now? Any books you recommend? I just finished the latest John Grisham novel. One of the saddest novels I’ve read. Each chapter was more tragic than the previous chapter. To me, not very enjoyable. Business Profile In 2014, Mike and his wife Cindy took over one entity of the company he had consulted for and renamed it Candu Graphics. At that time, Candu was located in Playa Vista, but the high cost of rent and long commute caused Mike to relocate the business to its current Westlake Village location in 2016. Although he was concerned about losing long standing client relationships due to the move, their retention rate ended up at 99.9%! Candu Graphics Sees Record Growth After Relocating to Westlake Village & Reconnecting with the Community Candu Graphics was started out of necessity in the fall of 1995. Mike Dutra, the owner, found himself as a single parent to his three children who were 7 years old and younger. “It was an extremely difficult time for our family,” explains Mike. “Being a single parent meant I had to make big adjustments to our lifestyle.” One adjustment was Mike’s career in the printing business. Since he was unable to work the long hours required as a General Manager, Mike became a consultant to print shops in the Los Angeles area. Simultaneously, he started a home-based graphic arts business in his spare time. A Conejo Valley resident since 1991, Mike had to reconnect with the community to help the business grow. The first thing he did was join the Greater Conejo Valley Chamber of Commerce and the Rotary Club of Westlake Village. Mike also rejoined the board of the now Yarrow Family YMCA. These groups have not only helped with his local business connections, but have also created many new friendships. One of Candu Graphic’s goals is to give back to the community. 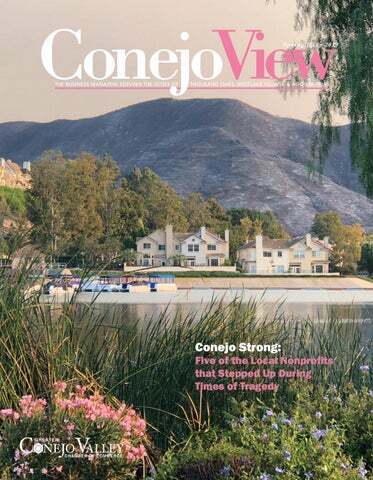 “Conejo Valley is an affluent community, but there is still a need to help. We help as much as possible with monetary and in-kind donations” says Cindy, co-owner of Candu Graphics. On the business side, Candu Graphics offers offset and digital printing, large format and indoor signage printing, bindery and fulfillment, mail services, promotional products and of course graphic arts. The production team is led by Trevin Happe, and his staff makes the “magic” happen. Known for speed and service, Candu Graphics has doubled their client base in the past three years and continues to grow. In addition to Southern California, companies from around the United States and the world send their jobs to the “Candu Crew.” Candu is timely, professional, and looks to create a partnership with all their clients. The company also has a facility at the Getty Center, one of the world’s largest arts organizations, which helps with the museum’s internal printing needs. From credentials for the Super Bowl and large MMA fights, to fundraiser galas, and any type of business needs, Candu Graphics is a one stop print shop. Candu would love to assist you on your next project. Come find out why Candu Graphics was named Westlake Village’s Business of the Quarter for the Spring of 2018! “I run my branch on service and your best interest.” For over 40 years, Montecito Bank & Trust’s dedicated associates have made a difference by working side-by-side with individuals, businesses and nonprofit organizations to create opportunities and help the local economy thrive. When you do business with a community bank, you’re making a difference too. Five New City Councilmembers The Greater Conejo Valley Chamber of Commerce represents the interests of business with government in the cities of Thousand Oaks, Agoura Hills and Westlake Village. The November 2018 election led to the departure of five local city councilmembers; meet the new elected officials who are sitting on the dais and giving their best to our cities. City of Agoura Hills CHRIS ANSTEAD I grew up in South Florida and attended college at the United States Military Academy at West Point. After serving our country as an Army Officer, I attended law school at the University of Florida and later earned an MBA from Cornell University. My wife and I have enjoyed raising our two daughters in the Conejo Valley and I currently work as a Government Accounts Executive for Amgen. Prior to running for city council, I served as an Agoura Hills Planning Commissioner from 2014-2015 and currently serve as the Treasurer for the local Sierra Club. As a newly elected official, I want to work with my fellow council members to solve the challenges of a growing city, such as traffic and quality of life issues. I will be focused on listening to the needs of our residents to ensure we are addressing the needs of the community. I also want to work on updating our emergency procedures, taking into account the lessons learned from the recent fires. DEBORAH KLEIN LOPEZ I grew up in Agoura Hills, went on to earn a degree in Mathematics and Economics from Northwestern University and then returned to raise my family. My path to City Council was organic. Professionally, my background is in financial analysis, project management and government, having worked for Reuters, J.D. Powers and the California State Senate. Iâ&#x20AC;&#x2122;m a Director on the Resource Conservation District for the Santa Monica Mountains, run a weekly winter homeless shelter and managed the campaign of a successful $27 million measure for LVUSD. While in these roles, I was advocating for cleaner energy, responsible development and increased public outreach. As a new councilmember, the Woolsey Fire really dovetailed these issues for me. Climate change is real, and the way we live, work, plan and build has to be environmentally sustainable. I am serving on the Clean Power Alliance board because delivering more renewable energy to residents and businesses is a top priority for me. Citizen outreach and engagement is also critical; I hope to expand our cityâ&#x20AC;&#x2122;s communication to both residents and businesses. I have been in service my entire life. Public safety is what I lived for 29 years in the fire service and was privileged to be in the position to help people on the worst day of their lives. Since retiring, I have devoted myself to public service through volunteer work as a local and national Red Cross responder. I also serve on the Conejo Open Space Trails Advisory Committee, Ventura County Grand Jury and joined our local Kiwanis Club. My primary goal on the City Council is to ensure that we address the need for housing in a measured way, create an environment where business can thrive and develop a plan for the future. That plan needs to reflect who we are as a community and prepare us for the next 50 years. Being responsive to the citizens is paramount to me, and I will always be available in the same way that Alex Fiore was in days gone by. I ran for the council because I believe I’m in an excellent position to do a good job for the citizens of Thousand Oaks. Based on my education, my long-term residence in Thousand Oaks, and my experience in local government, I have the requisite background to work with other council members to maintain and improve our lovely city. The challenge before us right now is to balance the improvement of Thousand Oaks Blvd. with pressures we are receiving from state government to expand our population with more affordable units. I would consider a limited amount of mixed-use development to provide this housing on Thousand Oaks Blvd. Recently I visited the neighborhoods in Burbank and Glendale where we grew up. No longer are they the attractive, semi-rural safe havens. Many of the single family homes have been replaced with apartments or have been mansionized to be completely out of character for their location. I will make maintaining our lovely neighborhoods a top priority. After graduating from UCLA, serving in the Navy and earning a Master’s Degree in Public Administration from the University of Washington, my wife and I moved to Westlake Village. In 1998, I began my career in non-profit administration and have spent the last twenty years working to solve California’s housing crisis. As a father of three children, I have embraced opportunities to become involved in the community; coaching 14 AYSO soccer teams, volunteering on the White Oak Elementary School PFC for six years and was a founding Board member of The Foundation for Las Virgenes schools. I also served the City as a member of the 2025 Strategic Plan Vision Committee and as the Chair of the Cultural and Recreation Advisory Board. My job is to work with my colleagues and our community to ensure that our “Westlake way of life” continues long into the future. We all need to work together to enhance and maintain our quality of life, ensure our schools and business community remain vibrant and our residents continue to feel that Westlake Village is special. After the Woolsey fire, we need to continue our focus on planning and public safety as well as increasing communication with our residents. MEMBERSHIP HOUR Tues., May 21, 12:00-1:30 p.m.
CONEJO SENIOR RESOURCE NETWORK Thurs., April 18, 8:15-9:45 a.m. GIFT FOR WOMEN Tues., June 4, 12:00-1:00 p.m.
40 UNDER FORTY AWARDS	Thurs., May 2, 6:00-8:30 p.m. CANYON Dinner & Awards hosted by Senator Henry Stern JUMP START NETWORKING BREAKFAST Sponsored By: Richard Ross Associates Fri., May 3, 7:30-9:00 a.m. SHERATON AGOURA HILLS HOTEL GIFT FOR WOMEN Tues., May 7, 12:00-1:00 p.m. 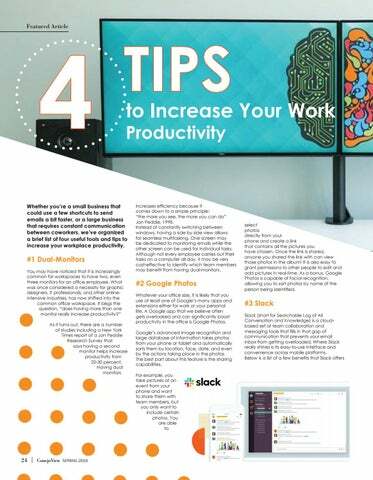 Whether you’re a small business that could use a few shortcuts to send emails a bit faster, or a large business that requires constant communication between coworkers, we’ve organized a brief list of four useful tools and tips to increase your workplace productivity. increases efficiency because it comes down to a simple principle: “the more you see, the more you can do” Jon Peddie, 1998. Instead of constantly switching between windows, having a side by side view allows for seamless multitasking. One screen may be dedicated to monitoring emails while the other screen can be used for individual tasks. Although not every employee carries out their tasks on a computer all day, it may be very cost-effective to identify which team members may benefit from having dual-monitors. select photos directly from your phone and create a link that contains all the pictures you have chosen. Once the link is shared, anyone you shared the link with can view those photos in the album! It is also easy to grant permissions to other people to edit and add pictures in real-time. As a bonus, Google Photos is capable of facial recognition, allowing you to sort photos by name of the person being identified. that make communication more convenient: • Channels – Communication in Slack happens in channels. You can create or join a channel that is particular to a certain project or group of team members. You can also create private channels that contain sensitive information and documents. Need a place to store all the company credit card receipts that only certain team members can access? Slack can do that! • Searchable Conversations – Within each Slack channel is a search bar that allows you to search for documents, conversations, and people within that channel. The results are sorted by date and the interface makes it easy to access the information you need. • Apps & Integration – Slack is conveniently designed to work with multiple applications such as Trello, a project management application that gives you a visual overview of current tasks and the team members involved. For example, you can create an event directly on Slack using Trello by sharing it with team members right into one of the channels. This integration works similarly with other apps such as Google Drive, Dropbox and Skype to name a few. #4 Dashlane Dashlane is a password manager application that works by storing all of your passwords into one application and making it easier for you to navigate through commonly used websites by automatically entering your passwords for you. However, Dashlane’s best feature is how it makes your accounts more secure. When you stay logged into Dashlane, you have the option of allowing the application to create a unique and very secure password that contains special characters and capital letters for each website you visit or application that you use. The only thing you have to do is memorize your master password; Dashlane does the rest. You can also sync your Dashlane account to multiple devices such as your phone or tablet to further secure and encrypt your passwords. There are similar password managers such as LastPass that can be just as effective; we recommend using a password manager that is right for you and your organization’s needs. If you’re somebody who visits multiple websites per day and wants to make the login process faster and more secure, Dashlane is a great solution. 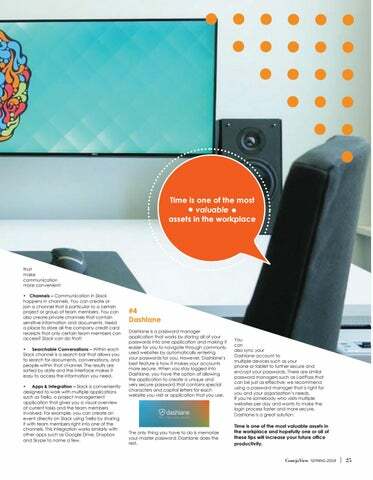 Time is one of the most valuable assets in the workplace and hopefully one or all of these tips will increase your future office productivity. Ventura Countyâ&#x20AC;&#x2122;s foster care system who are there because their parents failed to provide for their basic needs: shelter, food and safety. According to the Ventura County Human Services Agency, on any given day in Ventura County, about twenty-eight child maltreatment referrals are received with more than one-third of them involving allegations of domestic violence. Unfortunately, our county is not alone: we see news stories every day about children all over the United States removed from an abusive or neglectful home. We assume there must be a program or system that will take care of these children and make sure they are treated with dignity, given a safe place to live, so they can recover from their hardship and be a child again. But there is a story behind the story that few people speak about. According to research by National CASA, children with volunteer Advocates receive more services, experience shorter times in foster care, are half as likely to re-enter foster care and are substantially less likely to spend time in long-term foster care. It is the story of overburdened foster care and child welfare systems that – though full of well-intentioned and deeply committed people – cannot begin to meet the needs of the nearly 700,000 children in foster care in the United States. It is the story of a six-year-old boy separated from his brothers and sisters during the most vulnerable time in his life. The story of a fourteen-year-old girl who has been moved to six group homes and three schools, with two different social workers and four therapists over the past two years. It is a story that occurs over and over again in America’s foster care and child welfare system. ages, from 0-21. The work of recruiting potential volunteer Advocates and training them is an ongoing process. CASA asks all volunteer Advocates to serve for a minimum of 12-18 months or to the close of their case, and are proud that most accomplish this goal. Each volunteer Advocate must attend 12 continuing education hours per year to stay mindful of the ever-changing elements of their advocacy work. In addition to becoming a volunteer Advocate, there are other ways to help CASA in its mission. 1. A tax deductible donation provides CASA with the resources to continue its work and the work of its volunteers to advocate for foster youth in Ventura County. You can make a one-time gift or set up a recurring donation at www.casaofventuracounty.org. By joining Friends of CASA, you can help raise funds through events, programs and projects that enhance the public’s understanding and support of CASA. The group meets monthly; contact Pam Knitowski at pam@ casaofventuracounty.org for more information. Joinging the Outreach and Communications Committee, where you can speak at local events or to local service groups about CASA and/or host CASA informational booths at community events all over the county. Contact Alexis Minie at alexis@casaofventuracounty. org for more information. CASA of Ventura County is currently serving about 350 children with more than 220 volunteer Advocates per year. The program needs to double in size in order to serve all children who would benefit from having a volunteer Advocate – that one, consistent adult in their lives. CASA invites you to attend one of its monthly informational sessions to learn more about becoming a volunteer Advocate. Visit www.casaofventuracounty.org to view the schedule. ejico Grill & Tequila Lounge offers the real taste of authentic Oaxacan cuisine in the heart of Agoura Hills. Their dining experience takes a ‘straight from home’ approach with delicious and authentic Mexican cuisine made from the freshest of ingredients. The cuisine is primarily influenced by Oaxacan, Mayan and Southern Yucatan dishes. From fresh seafood dishes like Camarones Maya and Lobster Enchiladas to signature dishes like Mole Coloradito, a chicken entrée smothered in a deep red mole sauce with red chilis there is plenty to choose from. For a more shareable taste, try the Tlayuda appetizer dish comprised of homemade chorizo, fresh cherry tomatoes, black beans and queso fresco served on top of a large crispy corn tortilla, finished with a drizzle of our chipotle crema. The menu also includes more traditional dishes such as Steak Picado or Cochinita Pibil, pork in an achiote marinade slow-cooked to perfection, served with rich mayan spices wrapped in banana leaves and topped with the chef’s homemade habanero-onion citrus mix. The restaurant conveys a traditional design that creates a relaxing atmosphere and features an impressive display of Oaxacan art, elegant lighting, and over eighty fine tequila and mescal bottles imported from the Jalisco and Oaxacan regions. Guests can also dine on an expansive outdoor patio under the area’s iconic oaks trees at large community tables, by the outdoor fireplace or in private dining bungalows. In addition to authentic Mexican cuisine, Mejico Grill & Tequila Lounge’s nightlife scene makes them a popular draw for a wide array of guests. It starts on Friday nights with a mix blend of salsa, bachata and merengue dancing with live music by the house DJ. On Saturday evenings, guests dance the night away with live music by a variety of DJs and local salsa and bachata artists. Weekday specials include: Margarita Mondays featuring two for one Margaritas, Taco Wednesdays with $3 select tacos and daily happy hour specials from 2-6 p.m. daily. Mejico Grill and Tequila Lounge is open for lunch and dinner from 11:30 a.m - 9:30 p.m. Sunday through Thursday, and until 2:00 a.m. on Friday and Saturday. Catering services are also available. THE STUDIO WLV IS A CREATIVE AGENCY BASED IN NEWBURY PARK, SERVING THE LOCAL VENTURA COUNTY COMMUNITY. WE OFFER FULL-SERVICE MARKETING AND MEDIA SOLUTIONS TO TURN YOUR VISION INTO A REALITY. 2 Years B2B CFOÂŽ BMC CareNow Brendan's Irish Pub and Restaurant Orient Express Toastmasters Autism Society of Ventura County Goldcoast Coin Exchange, Inc. Dion Law Group Kiss N Makeup Artistry Academy Bantu Arts Atelier For Kids PathPoint Wuddabooth Photobooth 1 Year Pacific Patio Furniture Vet's Here Ad Leverage PC Recycle Palm Capital Management The Leukemia & Lymphoma Society Museum of Ventura County Westcon Engineering, Inc. Unity of the Oaks Agoura Hills World Champion Karate Farmers Insurance / Cindy Duitsman Insurance Agency CMIT Solutions of North L.A.
For membership information, contact Heather Macaulay at hmacaulay@conejochamber.org or call (805) 267-7505. Every Thursday @ 7 a.m.
1st & 3rd Thursday @ 10-11 a.m.
2nd & 4th Thursday @9-10 a.m.
*All Groups are Category Exclusive *PLEASE NOTE: Chamber members and future members are welcome to attend one complimentary meeting for each group. Chamber members must only belong to one of the three groups and Chamber membership must be in good standing to remain a group member. *Category exclusive means there is a rule of one member per business category. Starting a new tech company? We have labs and oďŹ&#x192;ces all ready to go! Just move in and youâ&#x20AC;&#x2122;ll be ready to invent the future! Conejo Valley Advanced Wellness owners, Michael Caro and Brandi Caro celebrated the opening of their center specializing in advanced functional and age management medicine, IV nutrition, weight loss and bio-identical hormones therapy with a ribbon cutting ceremony on January 24, 2019. As the sponsor of the Jump Start Networking Breakfast in January, Esther Bleuel of Tough Talk Coach invited everyone to explore “Getting Unstuck” the topic of her new book. Thousand Oaks Mayor, Rob McCoy presents a certificate at the ribbon cutting ceremony for Sage Mountain Senior Living in Newbury Park on January 31, 2019. Massage Envy Westlake Village owner, Shamika Lawrence cut the ribbon of her newest location providing therapeutic massages and skincare services on February 6, 2019 alongside Chamber Ambassadors. State of the University CLU guests in attendance left to right: Jill Haney, Montecito Bank & Trust, Al Adam City of Thousand Oaks Councilmember, Ingrid Hardy, Assistant City Manager, City of Thousand Oaks and Joe Weber, Chatsworth Products on February 1, 2019 at California Lutheran University. State of the University CLU featuring keynote speaker Chris Kimball, Ph.D. and Dean’s Council Members Panel on February 1, 2019 at California Lutheran University. Owner, Yair Vetchetein of Whetstone’s Barber Salon in Agoura Hills celebrated their ribbon cutting ceremony on January 15, 2019 pictured with Mayor Linda Northrup, City of Agoura Hills (far right) and Councilmember Deborah Klein Lopez (middle right). Edward Jones / Olivia Peterson 2629 Townsgate Rd. # 135 Westlake VIllage, CA 91361 (805) 496-6891 www.edwardjones.com/financialadvisor/index. ©2016 La Quinta Worldwide, LLC. All rights reserved. LA QUINTA, wake up on the bright side and the Sunburst Q are registered trademarks of La Quinta Worldwide, LLC in the US and certain other countries. Serving the greater Conejo Valley for over 20 years. â&#x20AC;&#x153;The adverse events which affected our community, inspired our community spirit.â&#x20AC;? Together, we are #TOSTRONG! Whether you're a small business that could use a few shortcuts to send emails a bit faster, or a large business that requires constant communication with coworkers or customers, this featured article offers 4 Tips to save time and money. Five of the local nonprofits that stepped up during times of tragedy and conintue to aid the long term recovery efforts. Meet the new Coucilmembers. 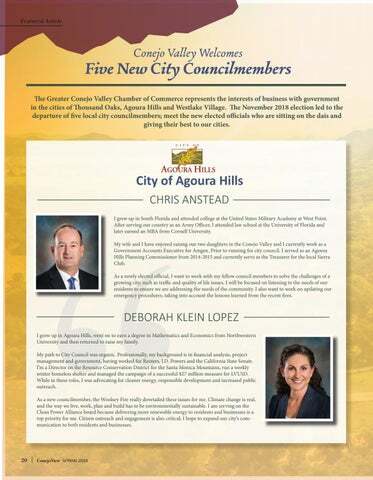 City of Agoura Hills' new members - Chris Anstead and Deborah Klein Lopez. 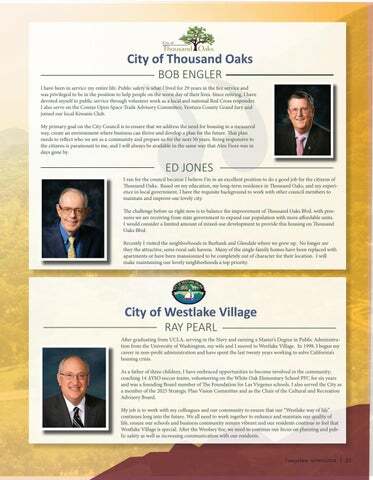 City of Thousand Oaks' members - Bob Engler and Ed Jones. City Of Westlake Villge's new member, Ray Pearl. 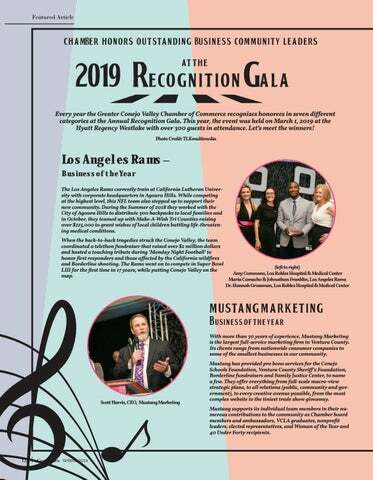 Feature story on the 2019 Gala Honoress for the Conejo Valley held at the Hyatt Regency Westlake Village on March 2, 2019. Meet the owner of Borderline Bar & Grill and OakHeart Country Music Festival Producer.